Lucerne, 1 December 2015 – International growth has been one of the three pillars of Emmi's strategy since 2008. Emmi is keen above all to achieve this growth in attractive niches, one of which is goat's milk products, which are becoming more and more popular around the world. Another is that of sustainably manufactured foods, such as organic foods. A third niche, and one in which Emmi is already making successful inroads not only in Switzerland but also abroad (in Spain and Chile), is that of lactose-free dairy products. By acquiring Redwood Hill Farm & Creamery in Sebastopol, California, an established manufacturer of premium products, Emmi has expanded in all three of these areas at a stroke. Emmi now earns 44 % of its turnover abroad; one-third through exports from Switzerland and two-thirds with products from foreign subsidiaries. Continuing growth abroad is part of Emmi's strategy. The intention is that it should be achieved through both organic growth and further acquisitions. Emmi's primary interest is in companies in niche markets, primarily in countries in which it already operates. At a time when economic conditions are difficult, the recent increase in income from North America, as well as the renewed strength of the US dollar, have played a vital part in stabilising Emmi's business. Emmi's success in among others, doing this is something it owes to its wide portfolio of subsidiaries and holdings in North America: Emmi Roth USA (in partnership since 2006, taken over in 2009), Cypress Grove Chevre (USA, taken over in 2010), The Icelandic Milk and Skyr Corporation (USA, a 25 % stake since 2013) and the cheese division of J.L. Freeman (Canada, taken over in 2015). The Redwood Hill Farm was founded in 1968 by the Bice family in Sonoma County, California; Jennifer Bice, the oldest of the ten children, took full control of the company in 1978. She is seen as a pioneer in building up expertise in goats' milk products in the USA and is also well-known among goat breeders. Today, Redwood Hill, with over 70 employees, earns turnover of more than 22 million US dollars a year. Its recipe for success is founded on three pillars: The first is goats' milk, for which there is ever-increasing demand in the USA, especially from urban consumers. Under the brand of «Redwood Hill Farm®», Redwood Hill is the acknowledged leader of the US market in goats' milk yoghurt and kefir. For example, the «Redwood Hill Farms® Plain Goat Milk Yogurt» in one-litre cups is the country's biggest-selling large yoghurt distributed via the American «Natural Food Channel» and generates more sales than any comparable yoghurt made from cow's milk. The second is that its success is founded on its striving to set itself apart. Lactose-free products are a relatively new niche that is as yet little served, and Redwood Hill is moving into it with a distinctive and diverse range of lactose-free organic products made from cows' milk. Thirdly, Redwood Hill relies on a sustainability concept whose credibility derives from its consistency. The concept starts with the company producing its own milk in ways that are natural and kind to animals: in 2005, Redwood Hill Farm was the first goats' milk farm in the US to be awarded the «Certified Humane Raised and Handled®» label by the «Humane Farm Animal Care® (HFAC)» organisation. The managers in Sebastopol also care about protecting the environment. Central to their expression of this concern are the environmentally-friendly generation of power using solar panels (8,000 m2), the minimisation of waste, as well as the conservation and recycling of water, which is of considerable importance in California – a state that has suffered from severe drought for many years. Redwood Hill also makes an active contribution to many charitable organisations. All Redwood Hill's products are trustworthy and of high quality and as such have won over consumers throughout the USA, but especially the greater San Francisco Bay Area. That's why it has been possible to continuously add to the range presented under the «Redwood Hill Farm®» brand, which, at the time the company was founded, comprised only goats' milk products. It now includes yoghurt, kefir and cheese made from goats' milk. All these products are invariably made from milk in its natural state (i.e. not standardised or homogenised), and artificial ingredients, preservatives or milk powder are added to them. Since 2010, the «Green Valley Organics®» brand range of goats' milk products has been expanded by the addition of organic products made from cows' milk. The milk used for this purpose is bought locally in Sonoma County and has also been awarded the «Certified Humane Raised and Handled®» label. Redwood Hil’s present owner and CEO, Jennifer Bice, cares deeply about her company's continued existence: "I am confident that Emmi is the right choice for Redwood Hill’s future. I feel completely aligned with Emmi’s very high standards for quality, their strong emphasis on employees and their commitment to sustainability. Most importantly, they have encouraged us to maintain the way we do business here at Redwood Hill." Jennifer Bice, together with her existing management team, will continue to manage Redwood Hill. The company will also retain an independent market presence. The plan is to make use of specific synergies within the Emmi Group in order to build on the potential for growth than has been identified. For example, the company is working with Cypress Grove Chevre (which is also based in California) to find ways of spreading goats' milk production, which is highly seasonal. “Emmi now has a tried and tested network of firms successfully operating in the premium and specialities market in North America. We have shown our ability to do a particularly good job of integrating pioneering family-owned enterprises into the Emmi Group over the long term. Maintaining the culture specific to a firm helps to further reinforce its success on the market”, said Urs Riedener, the Emmi Group's CEO. Emmi will take over Redwood Hill entirely by the end of the Year, while the goat farm remains owned by Jennifer Bice. The parties have agreed not to disclose the purchase price. Emmi is the largest Swiss milk processor and one of the most innovative premium dairies in Europe. In Switzerland, the company focuses on the development, production and marketing of a full range of dairy and fresh products as well as the production, ageing and trade of primarily cheeses from Switzerland. Outside Switzerland, Emmi concentrates on brand concepts and specialities in established European and North American markets, and increasingly in emerging markets outside of Europe. The primary focus in fresh products is on natural, lifestyle, convenience and health products. In the cheese business, Emmi positions itself as the leading company worldwide for cheese from Switzerland. Emmi’s customers are the retail trade, the hospitality and food service sector and the food industry. In Switzerland, the Emmi Group includes around 25 production sites of every size. Abroad, Emmi and its subsidiaries have a presence in 13 countries, seven of which have production facilities. Emmi exports products to around 60 countries from Switzerland. In 2014, Emmi posted net sales of CHF 3,404 million and a net profit adjusted for extraordinary effects of CHF 109.4 million. In the first half of 2015, the company achieved sales of CHF 1,563.0 million and an adjusted net profit of CHF 46.6 million. The company employs around 5,300 staff (full-time equivalents), of which 3,000 in Switzerland. Located in Sonoma County among the picturesque redwood trees of the Northern California Coast, 60 miles north of San Francisco, Redwood Hill Farm & Creamery is a different kind of dairy. It began in 1968 as a small, family farm run by the Bice family, producing delicious, award-winning goat milk dairy products and is operated by Founder Jennifer Bice to this day. Excellence is a top priority and Redwood Hill Farm & Creamery takes pride in producing the best tasting, least processed goat milk yogurt, kefir and artisan cheeses. The company focuses on supporting Sonoma county workers and community organizations, small-scale dairy farmers, and the dietary needs of consumers. Redwood Hill Farm & Creamery also makes its sister brand, «Green Valley Organics®». «Green Valley Organics®»lactose-free, real dairy yogurts, kefirs, sour cream and cream cheese were created so people with lactose intolerance could bring real dairy back into their lives. «Green Valley Organics®»is made with Flourish®, the company’s custom blend of 10 live and active cultures. 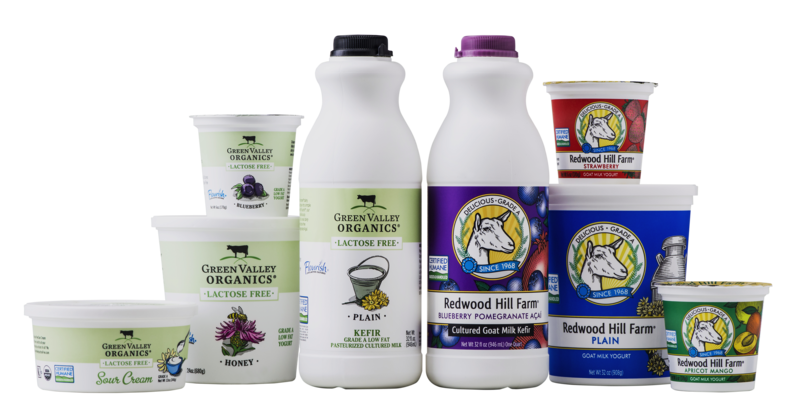 Both «Redwood Hill Farm®»and «Green Valley Organics®»dairy products are made at the company’s solar-powered creamery in Sebastopol, California, with milk that carries the «Certified Humane Raised and Handled®» label. In 2005, Redwood Hill Farm was the first goat farm in the United States to become Certified Humane.